I literally have 3 of these in my bathroom at the moment, I bought them a while ago and after using lots of different things over the last few months I had forgot about these sat in my drawer. Whilst having a little rummage I decided to crack a new one open and give my hair a little coconut loving! I forgot how much I love this stuff - it is a total and utter bargain at only £1.99 and makes my hair so soft and shiny. If you're looking for a pick me up for your hair but are on a tight budget this is the stuff for you! Now you've probably seen my review on this already (if not check the side bar as I think it's still in my most read of this week or click HERE)! I have fallen in love with this book, it is amazing for everything health and fitness related. From recipes to self-esteem Lucy has covered everything in an easy and helpful fashion, if you're looking to turn your life around this is definitely worth a look! I was recently sent these new products from the lovely people at MUR and I am obsessed with them! These are a new range of highlighting powders and after using their Vivid Baked highlighters to deaht I knew I was going to be a fan of these too! There are 3 different shades which you can read all about here, from a gorgeous light pink undertone to a more bronzed goddess shade! My favourite at the moment is Breathe! I bought this and a replacement for sweet snacks. I have such a sweet tooth, things like chocolate and biscuits are a serious weakness in my diet! But so far in 2015 I've managed to stay clear of them for the most part! I have been loving this stuff with natural yogurt, fresh fruit and a little bit of honey! I know granola isn't the most healthy option but it's better than a bar of galaxy right? I got this little beauty from my little brother for Christmas! Saving money is something I really want to do in 2015 and this is going to help! It's so pretty I'll never want to smash it! I recently purchased this and have been so so impressed! I am literally the worst nail painter in the history of the world! BUT.... the brush on this is so amazing, it makes it so easy to paint my nails... plus the colour is gorgeous! I've worn this a couple of times now and have been so proud of myself with the results haha! Oh my god - this show is amazing! I saw the trailer for it when I was in Florida back in September and I knew it was something I was going to enjoy. I literally watched the whole first season in less than 2 days. If you like crime/law dramas with a bit of mystery you will love this! It's like Legally Blonde meets Scandal, bring on season 2! Yay! It's official, I finally have a laptop again! Yes, that's right I have been without a functioning laptop for a year now - I have been blogging on a netbook.... do you know how hard that is? I've definitely learnt some patience I tell ya! It is so nice to have itunes back and I finally feel like I can blog properly... and hopefully get my youtube up and running again soon! Honey when I tell you, I knew from the first episode of how to get away with murder it was going to be my second favorite show (Scandal my above all favorite of course). I feel like a junkie counting down to the premier on Jan. 29. Congrats on the laptop, I got a HP Envy TouchSmart 17 a few months ago and I absolutely love it! I'm loving the idea of the money pot! I totally need one so I stop spending money I'm meant to be saving! I'm begging my boyfriend to go and see "Into the Woods." Love your picks! I got the Frozen money pot too since I wanted to save more this year, and I'm already dreading smashing it open. And I can't wait to see Into the Woods, I'm hopefully seeing it at the weekend! It looks amazing - and it's such a great cast. I've been eyeing up that makeup revolution, it looks so so pretty! I want to see Into the woods so bad as well, I saw the trailer, looks amazing! Clickity click here, if you wish! 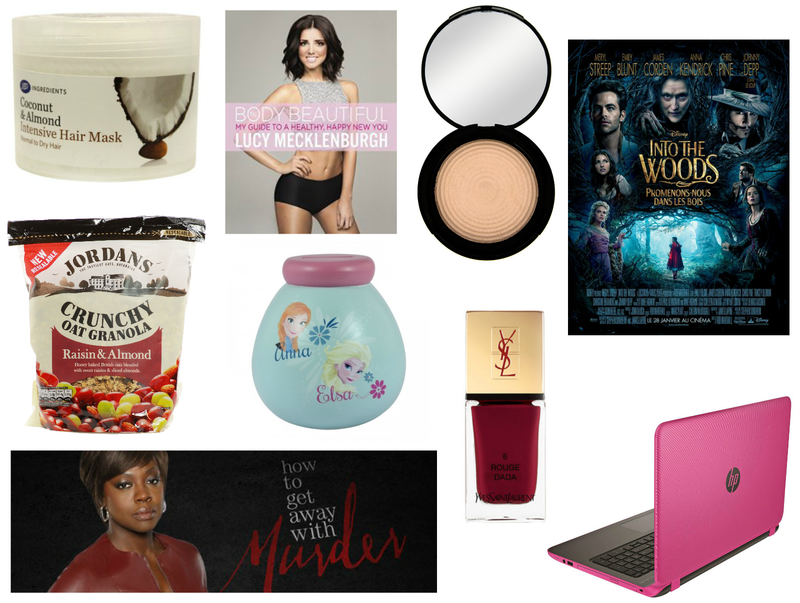 All things Make-up, Fashion and Beauty, On a budget! Love this I've gotta try some of these out! I love that coconut and almond mask - for £1.99 you can't go wrong, it smells so lovely too. I have been looking for a really good yet cheap hair mask, so I shall have to pop in to boots and purchase this one, looks great and I loved all your favourites! I cant wait to go see Into the Woods, well I need to persuade my boyfriend first haha. For shooting scenes, Under Armour has established relationships with the University of Maryland, Towson University, Timberland Outlet online University of Maryland, Baltimore County, and big indoor training facilities such as the Reaper's Den in Columbia. In 2013, Lewis narrated and helped script a Baltimore-based commercial in which high school football players from Dunbar, St. Francis and Gilman race to practice on bikes, Timberland Sale trains and in a pickup truck. A siren is heard and a helicopter hovers overhead.